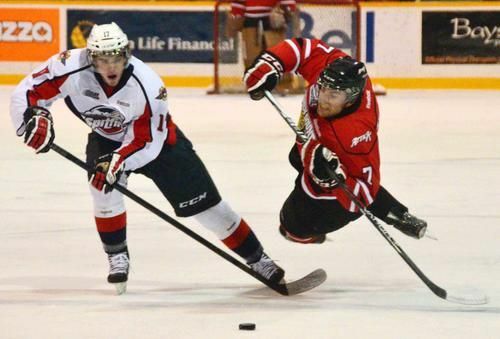 Dan Catenacci had an active third period Thursday, recording a Gordie Howe hat trick in a span of 5:26 as Owen Sound opened the 2012-13 season with a 6-1 win over Windsor. The Attack has Friday off before returning to work Saturday versus Saginaw. Catenacci followed up his own rebound on the power play to give the Attack a 4-0 lead at 1:36 of the middle frame. At 5:05 he earned an assist on another man advantage marker. Just under two minutes later, Catenacci was cited for his second career fighting major after his cross check set off a minor melee. Elsewhere, Alex Lepkowski finished +2 as Barrie got past Ottawa 6-4. Mark Scheifele (WIN) and Andreas Athanasiou (DET) paced the winners with two goals apiece. The Colts continue opening weekend Friday at Kingston. At the USHL Fall Classic, Judd Peterson notched an assist as Cedar Rapids edged Lincoln 4-3. Denver commit Landon Smith scored a hat trick for Cedar Rapids. The RoughRiders close the preseason Friday afternoon when they take on Tri-City.